I've been printing 6-12 hours a day for the past 2-3 weeks and tonight I noticed that circular items are printing with squared edges. 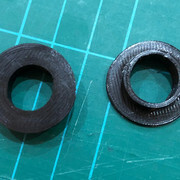 In some places the circle just isn't round, and in others it's clear that the extruder nozzle has laid down filament inconsistently - so in some parts of the circle there's 2 obvious lines of filament (that make for a thick wall) and in others there's just one. This is the first time I've noticed this as the Malyan's always printed perfect circles in the past. I'm wondering if it's being caused by the Y Axis. The bed is suddenly grippy in the middle of the rods and looser as its moved toward the front or the back end of the rods. I fitted Igus drylin bearings a few months back and I'm not convinced the standard rods are straight. If it id being caused by the Y Axis perhaps there's dirt build up between the bearings and the rods? Or does it sound like it's something else? Here's a pic of a couple squared 'circles' I printed tonight. Hopefully the uploaded and converted image is good enough quality to see. They look pretty bad. Looks like the igus drylin bearings were binding on the y axis rods. Not entirely sure why. After removing the heated bed and checking the bearing blocks were tight and still lined up correctly (they were) I just cleaned everything up, put it all back together and levelled the bed. Seems to be fine again now, and the bed is slipping back and forth easier again. Only issue is there's a rattling now from the igus bearings, so whilst they're not binding they are probably tenths of a mm too loose, so they can vibrate. I won't be installing dry bearings again. Too much hassle ironically. Cheers mate. I've been thinking about getting a Delta recently, but gotta sell some stuff first to raise the cash and make some room! Page created in 0.060 seconds with 35 queries.